This paper reviews the current development of artificial intelligence (AI) techniques for the application area of robot communication. The research of the control and operation of multiple robots collaboratively toward a common goal is fast growing. Communication among members of a robot team and even including humans is becoming essential in many real-world applications. The survey focuses on the AI techniques for robot communication to enhance the communication capability of the multi-robot team, making more complex activities, taking an appreciated decision, taking coordinated action, and performing their tasks efficiently. We present a comprehensive review of the intelligent solutions for robot communication which have been proposed in the literature in recent years. This survey contributes to a better understanding of the AI techniques for enhancing robot communication and sheds new lights on future research direction in the subject area. Alsamhi, S., Ma, O., & Ansari, M. (2018). Predictive estimation of the optimal signal strength from unmanned aerial vehicle over internet of things using ANN. arXiv preprint arXiv:1805.07614. Alsamhi, S. H., & Rajput, N. S. (2015). Implementation of call admission control technique in hap for enhanced qos in wireless network deployment. Telecommunication Systems, 1–11, https://doi.org/10.1007/s11235-015-0108-4. Barriquello, C. H., e Silva, F. E. S., Bernardon, D. P., Canha, L. N., Ramos, M. J. D. S., & Porto, D. S. (2018). Fundamentals of wireless communication link design for networked robotics. https://www.intechopen.com/books/service-robots/fundamentals-of-wireless-communication-link-designfor-networked-robotics. Bassil, Y. (2012). Neural network model for path-planning of robotic rover systems. arXiv preprint arXiv:1204.0183. Bassil, Y. (2012). Service-oriented architecture for space exploration robotic rover systems. arXiv preprint arXiv:1204.0185. Challita, U., Ferdowsi, A., Chen, M., & Saad, W. (2018). Artificial intelligence for wireless connectivity and security of cellular-connected UAVs. arXiv preprint arXiv:1804.05348. Challita, U., Saad, W., & Bettstetter, C. (2018). Cellular-connected UAVs over 5G: Deep reinforcement learning for interference management. arXiv preprint arXiv:1801.05500. Chen, M., Saad, W., & Yin, C. (2017). Echo state learning for wireless virtual reality resource allocation in UAV-enabled LTE-U networks. arXiv preprint arXiv:1708.00921. Dutta, V., & Zielinska, T. (2015). Networking technologies for robotic applications. arXiv preprint arXiv:1505.07593. Fink, J. (2011). Communication for teams of networked robots. Ph.D. thesis. University of Pennsylvania. https://repository.upenn.edu/cgi/viewcontent.cgi?article=1496&context=edissertations. Liu, L., Liu, S., Zhang, Z., Yu, B., Tang, J., & Xie, Y. (2018). Pirt: A runtime framework to enable energy-efficient real-time robotic applications on heterogeneous architectures. arXiv preprint arXiv:1802.08359. Mohamed, N., Al-Jaroodi, J., Jawhar, I., Noura, H., & Mahmoud, S. (2017). UAVFog: A UAV-based fog computing for internet of things. In 2017 IEEE SmartWorld, ubiquitous intelligence & computing, advanced & trusted computed, scalable computing & communications, cloud & big data computing, internet of people and smart city innovation (SmartWorld/SCALCOM/UIC/ATC/CBDCom/IOP/SCI) (pp. 1–8). https://doi.org/10.1109/UIC-ATC.2017.8397657. Narasimhan, R., & Cox, D. C. (1998). A handoff algorithm for wireless systems using pattern recognition. 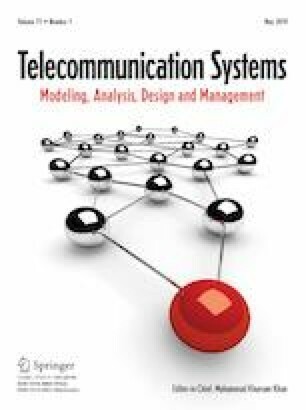 In The ninth IEEE international symposium on personal, indoor and mobile radio communications (Vol. 1, pp. 335–339). https://doi.org/10.1109/pimrc.1998.733570. O’Shea, T. J., & Hoydis, J. (2017). An introduction to machine learning communications systems. arXiv preprint arXiv:1702.00832. O’Shea, T. J., Karra, K., & Clancy, T. C. (2017). Learning approximate neural estimators for wireless channel state information. arXiv preprint arXiv:1707.06260. Shibata, K. (2017). Communications that emerge through reinforcement learning using a (recurrent) neural network. arXiv preprint arXiv:1703.03543. Tai, L., & Liu, M. (2016). Deep-learning in mobile robotics-from perception to control systems: A survey on why and why not. arXiv preprint arXiv:1612.07139. Tai, L., Zhang, J., Liu, M., Boedecker, J., & Burgard, W. (2016). A survey of deep network solutions for learning control in robotics: From reinforcement to imitation. arXiv preprint arXiv:1612.07139. Tripathi, N. D., Reed, J. H., & Van Landingham, H. F. (1998). Pattern classification based handoff using fuzzy logic and neural nets. In 1998 IEEE international conference on communications, 1998. ICC 98. Conference record (Vol. 3, pp. 1733–1737). https://doi.org/10.1109/icc.1998.683126. Wazid, M., Das, A. K., & Lee, J. H. (2018). Authentication protocols for the internet of drones: Taxonomy, analysis and future directions. Journal of Ambient Intelligence and Humanized Computing. https://doi.org/10.1007/s12652-018-1006-x.